Fundamental Steps before purchasing your new swimming pool in Montgomery County. It’s an exciting time for the family, and everyone is excited to get wet and make a splash, the kids are dreaming of what games they will play, and you’re thinking about what cool parties you can host with your friends all around the new family pool right in your own backyard. So before we go running to the pool to jump right in, let’s relax just a bit and make sure we are counting our steps to swimming pool construction success. 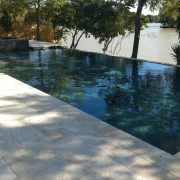 Custom inground gunite pools around Montgomery County TX can be created to compliment just about any shape of backyard, so long as the easement and set back lines are not extremely close, and in certain cases it is found that a pool just may not work, but these are very rare. To build a pool in Texas, you must be the owner of the property and home. 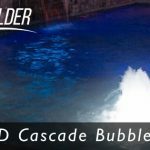 Consider any elevation changes in your backyard, specific to water drainage purposes, as these will have to be mitigated throughout the pool construction process. Make sure that your new pool is not prone to flooding! In many cases our clients will have outside pets, usually dogs. When considering to install a new pool you will want to make sure that your outside pets still have enough room to run and play, and use the bathroom without causing it to be overly complicated. You will also need to think about the access to your property, how will the heavy machinery enter the backyard? Usually one side or the other of your fenced property will suit the 90″ requirement of most excavation equipment. In some rare cases we have been required to enter onto the neighbors property line to enter the client backyard. Talk to your neighbors and let them know of your intentions to build a new pool, they will appreciate your advance notice and may even allow you to use a portion of their property, so long as we clean it all up! The next stage to gathering accurate information about building a pool in the neighborhood that you live in will be at your HOA office, to those that it applies. In today’s world of tract homes and subdivided neighborhoods that are master planned, you will need to check first with the neighborhood architectural committee to see if there are any special requirements or procedures for installing a new swimming pool. Most HOA rules and deed restrictions are going to be fairly simple and similar, however, we have found only a handful that require more than the typical HOA, and we can help you. 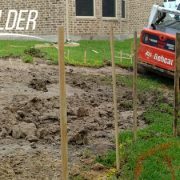 Make sure to get all of the details that you can including MUD deposits and/or water rate changes that might affect your ongoing budget after the pool is completed. Most HOAs will provide a package of information that you can review with us. On the other hand if you own private property with land, you can go as mild or as wild as you want without any direct oversight of your neighborhood! We will build your pool to the same specifications as if it were inside of the city limits, so that you can count on top level quality custom pool construction no matter where you live! In many cases, the HOA will not approve a request to build a new pool unless it has been reviewed and approved by the local city municipal permitting or zoning board. So if you live inside the city limits, this will most likely be your very next stop. Make a phone call to the permitting office to get some general information, most of which you will probably be able to find online at their website. We take a personalized approach to getting your pool project off the ground, which includes taking care of the headaches such as City Permitting for you. It’s all part of our job to make it easy for you to get that pool! Now that you have been through the bureaucratic governmental hula-hoop just to get the approval to build a new pool, it is time to sit down and consider the very start of the project, the BUDGET and DESIGN. Since our dreams can run wild and they don’t always match our budgets, this is when it’s time to call us in for a free in-home consultation. 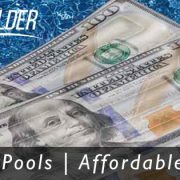 We are here to help you discover the possibilities and customization features that you can include with your pool based on the budget you have to work with. Many of our clients need to make the decision to either finance the pool or pay cash. 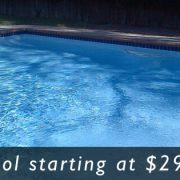 No matter what your budget is, with pools starting at around $30,000.00 we can get you swimming! Related Articles; Choose Your Pool Design Options, How much Does a Pool Cost, How long does it take to build a new pool, and much more! 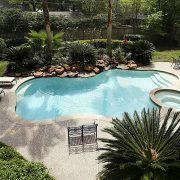 Your Pool Builder of Texas is a swimming pool contractor in Montgomery County Texas providing quality built custom pools in and near Conroe TX Montgomery TX The Woodlands TX and Huntsville TX, we are here to help the pool owner make sound pool purchasing decisions, and follow through with the absolute top level construction practices. 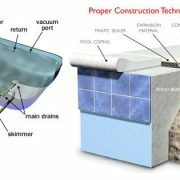 To learn even more about the swimming pool construction process.